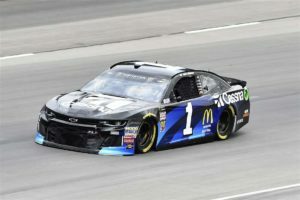 (NASCAR)—Joplin driver Jamie McMurray has had his best finish in 33 races with a third at the Texas Motor Speedway, his first top ten this year and his best finish since he was the runnerup at Talladega last May 7th. McMurray (right) was in or near the top ten most of the afternoon after starting 24th and ran as high as second late in the race before finishing behind Kyle Busch and Kevin Harvick. 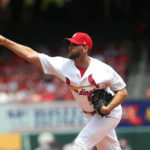 The win is Busch’s first of the year after three second-place finishes. Harvick already has three victories in 2018. McMurray also ran in the Saturday’s second-tier NASCAR race, recovering from a lap nine spin and light contact with the wall to come home seventh. McMurray is running a limited number of races in that series this year. He hasn’t raced in that series since 2013. Clint Bowyer started third, ran in the top ten in the first two stages of the Sunday race and finished ninth. NASCAR heads back east and back to a short track next week: the concrete half-mile at Bristol. (INDYCAR)—Defending IndyCar series champion Josef Newgarden makes the most of a new set of tires and moves from fourth place to the winner’s circle in the last thirty laps of the Saturday night race at Phoenix. He passed rookie Robert Wickens with three laps to go. Wickens finished second. Newgarden won at a record speed of 147.395 mph. The race on the 1.022-mile track also saw a record twelve lead changes among nine drivers, another record. IndyCar moves to the streets of Long Beach next weekend, the last race before the two May races at Indianapolis. (Formula 1)—Sebastien Vettel has won his second race in the young F1 season, holding off Valtteri Bottas to win at Bahrain. Defending F1 champion Lewis Hamilton came back from a penalty to finish third. The American Haas Automation team posted a fifth-place finish with Kevin Magnussen, equaling the team’s best finish since entering Formula 1 in 2016. Vettel’s win gives him a 17-point lead over Hamilton after two races.